Cognizant of the threat Climate Change poses to the region’s survival and continued development, the Caribbean Community Climate Change Centre launched the 1.5 ˚C Stay Alive campaign ahead of COP15 in December 2009. The two tiered campaign sought to sensitize citizens across the Caribbean Community about the impact of Climate Change on livelihoods in the region, and make a convincing case at the global level for the reduction of GHG emissions to a level not exceeding 350 ppm (parts per million) as an effective means of stabilising global warming. Owing to the region’s vulnerability to climate change and variability and its particularly youthful population, the Centre seeks to engage this significant demographic to shape a robust and appropriate range of responses to ensure climate resilience and safeguard livelihoods. In light of this, the Centre supported a Youth Forum on climate change aimed at high school students in Belize in 2010. Through this initiative, students were engaged about how their individual actions contribute to the broader challenge of climate change and the ways in which they can both adapt and mitigate such amidst a changing and variable climate. The project also engaged teachers to examine ways in which climate change education may be mainstreamed into the education sector, and resulted in the creation of a climate change toolkit. The Centre has since broadened its effort through the crafting of curricular resources designed for Caribbean children ages 12 to 16. These resources, crafted by educators in collaboration with the Centre’s technical team, forms part of the Centre’s thrust to embed Climate Change in the region’s education sector beginning in Belize. The four unit curriculum (The Warming Climate, Sea Level Rise, Pine Forest and Social Impacts of Global Warming), includes classroom face to face interaction, field trips, workbooks and varied assessments, has a total of 46 wide-ranging lessons with supporting resources and several videos. The teaching and learning activities can be modified to suit local situations and the ages of the students. A variety of extended activities have been included, which should be viewed as suggestions and so other activities can be substituted. The intent is an attempt to teach complex concepts with uncommon terminologies to young people. If they are to appreciate what is being taught, the terminologies must be clear to them. It is imperative that today’s youths are made aware of what the impacts of Climate Change and Global Warming could be, and so that knowledge would assist in making them appreciate the ramifications. The students need to know who will be vulnerable and in what ways. Armed with the necessary information, it is hoped that awareness will be developed and spur changes in habits, practices, and values. Such would contribute to understanding mitigation and adaptation measures suggested. The resource comprises teaching and learning activities and a range of supporting materials including worksheets, photographs, posters, suggestions for power point presentations, videos and field trips. Most importantly there is much resource information for the teachers who need to understand the concepts they are expected to teach. The prepared, well informed, confident teacher will always succeed in teaching effectively and as a result, students will learn. In the references listed, there are numerous websites and books. Comprehensive glossaries are included. Word search and crossword puzzle are suggested assignments which should assist the students in comprehending the vocabulary used throughout. There are also a few appropriate poems and songs which can be used to encourage self-expression and facilitate student involvement. The cross-curricular approach used in most lesson plans is in accordance with accepted philosophies and principles of education. While students learn in groups, they will be encouraged to investigate, observe, question, predict, test, collect, record, analyze data, draw conclusions, and think critically. Below is an outline of the four units, associated lessons and videos. Each of the four units containing the curricular resources are hyperlinked and may be downloaded for perusal. The videos associated with each lesson are hyperlinked for viewing. 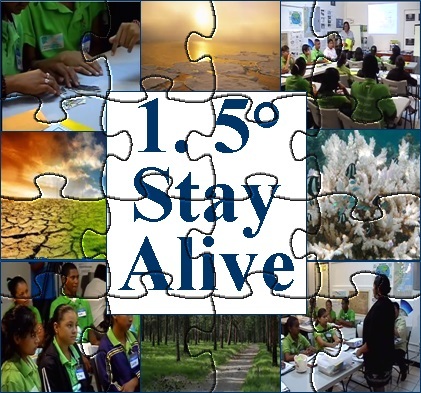 Download your copy of the 1.5 Stay Alive Education Initiative.